The Civil Affairs (CA) team here lost a good man a couple of weeks ago. He and three other soldiers were killed in an IED strike. He was at a Special Forces firebase in another part of the province. I never got to meet the man. He volunteered to serve at the firebase shortly before I arrived here because the CA team was short on personnel. He was set to rotate back to Tarin Kowt. Everyone here, not just the CA folks but everyone, was hit pretty hard. By all accounts he was a pretty cool guy and a go getter. This was his second tour in Afghanistan. He served at another PRT on his first tour. The team leader was there at drill weekend when the call was put out for volunteers and SSG Newman stepped up. He didn’t have to but he wanted to come back to Afghanistan because he really liked the people here. He was in the middle of earning his Bachelors degree but he put it all on hold. His parents and siblings survive him. He didn’t have a bride or children. He was in his twenties so he probably wasn’t even contemplating having a family just yet. He was still slogging through college. The PRT had a memorial ceremony for SSG Newman last week. I have attended a few military funerals but never a memorial ceremony in a combat zone. It follows a format that has been handed down through millennia. A student of the classics, celtic, or Scandinavian histories will recognize it. The soldiers assembled in front of the memorial to SSG Newman, which was a rifle and bayonet stuck into the ground, or in this case a block of wood with a pair of boots in front, dogtags hanging from the pistol grip, and a helmet on the buttstock. The unit was called to attention, given the order to present arms, then the national anthem was played. The chaplain gave a short prayer. The PRT commander, the CA commander, the team leader, and a fellow soldier all gave remarks about SSG Newman. The chaplain sang a hymm then the chaplains assistant gave a closing prayer, and then we had final roll call. The Sergeant Major called off a few names and then got to SSG Newman. The Sergeant Major called for SSG Newman three times. While SSG Newman was called, the firing squad fired three volleys. Everyone then presented arms and Taps was played. After order arms, the CA unit marched in front of the memorial and rendered a final salute. They were followed by the command team (CDR, XO, and the SGM). At that point, the formation was dismissed. The soldiers paid their respects to SSG Newman and gave their condolences to the CA team. When I paid my condolences to the team chief who I now consider a good friend all I could see was how tore up he was. Losing a soldier is a helluva thing and it was something I have never experienced. As a former commander I can relate to what he was going through. Officers who have held the burden of command will know what I speak of. We lost a man in the prime of his life doing what he believed in and serving alongside us. He was a volunteer on so many levels. He volunteered for active duty after high school. He transferred to the Reserves so he can start his college education. He volunteered for Airborne School when given the opportunity and he volunteered for Afghanistan twice. He volunteered to be assigned to the toughest, most dangerous part of this province after a fellow CA team member was shot in the arm and had to go on medical leave for rehab. I am reminded of a passage that describes SSG Newman. And I said, "Here am I. Send me! We here at the Tarin Kowt PRT send our deepest condolences to the Newman family. We won’t forget him and I regret not having met him. We will carry on the fight and will always remember SSG Newman’s sacrifice. 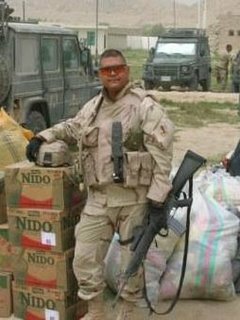 Those of us who knew SSG Newman are proud to have served with him. We have picked up our guns and are now back at work. We are carrying on with our duty, just like SSG Newman would want us to. God bless you and your family. God speed, SSG Clinton Newman.